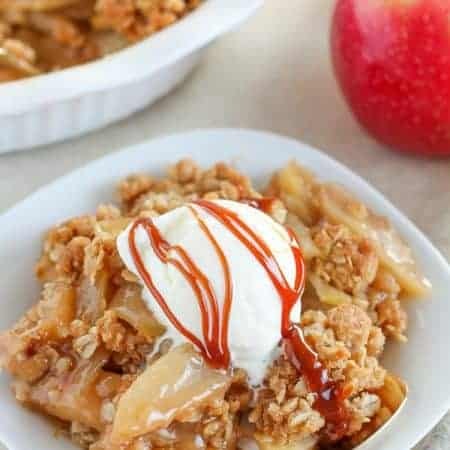 I try to share my favorite recipes here – the ones my family really love, and this one falls in the top of that category. 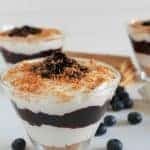 These parfaits are SO good. 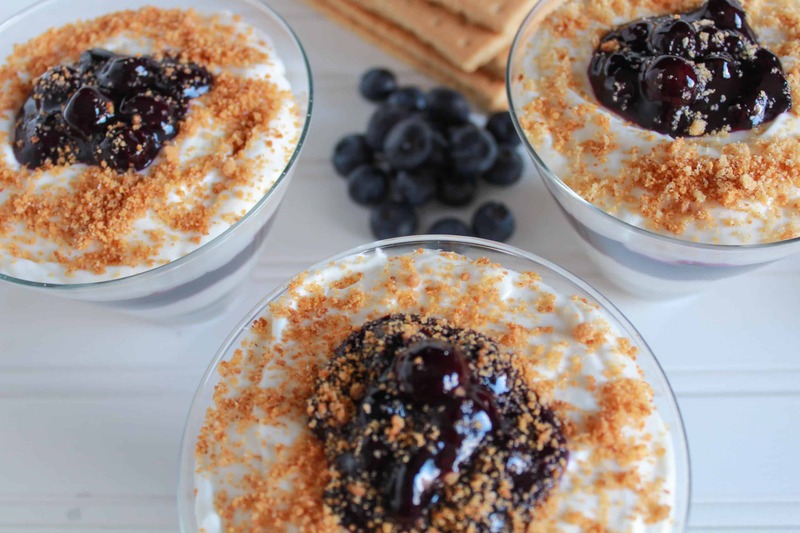 They’re made up of crisp, buttery graham cracker crumbs layered with a creamy, rich cheesecake filling and a juicy fresh blueberry sauce. The creamy filling and crunchy graham cracker crumbs are heaven – I love the contrasting textures. As for the blueberry sauce, I cannot say enough good things about it. I make it all the time as a topping for pancakes, french toast, yogurt and ice cream – it’s fantastic. 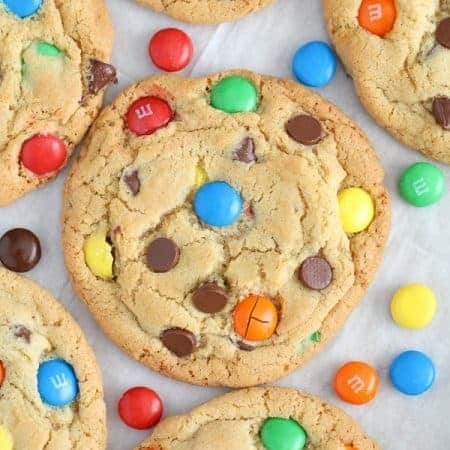 Even though this recipe has several steps, they are all very easy. If you’re in need of some shortcuts feel free to use canned pie filling instead of the blueberry sauce or cool whip in place of the whipped cream. Enjoy! 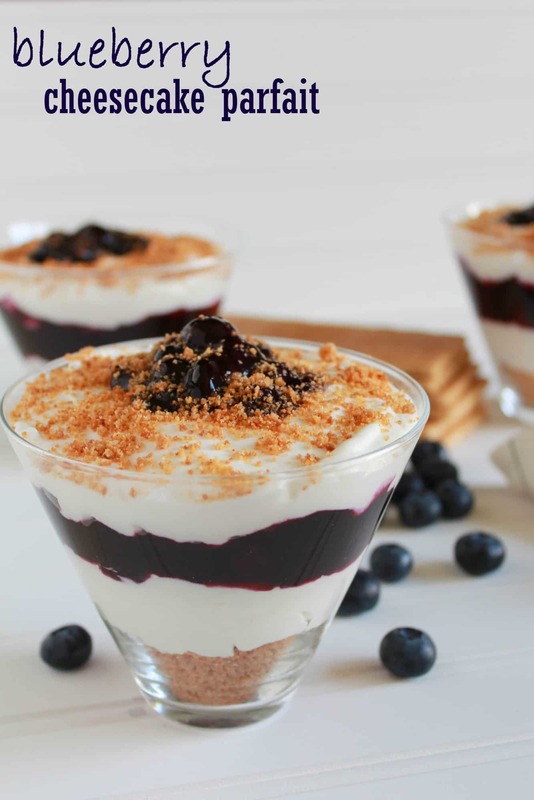 Fresh blueberry sauce layered with graham cracker crumbs and a creamy no-bake cheesecake filling. Combine the orange juice, sugar and cornstarch in a medium saucepan and bring to a boil, stirring occasionally. When the mixture is translucent and thickened, stir in the blueberries and simmer for 5-7 minutes, until about half of the berries have burst. Off the heat, stir in the lemon zest and lemon juice. Allow to cool slightly, then transfer to a covered bowl and refrigerate until cold. 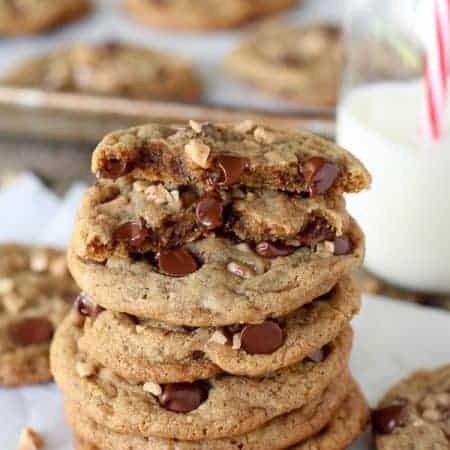 Combine graham cracker crumbs with 2 tablespoons sugar and melted butter. You can set the crumbs aside to use as is or you can lightly toast them in a skillet over medium heat for about 10 minutes. This will give the crumbs an extra crunchy texture and buttery flavor. If toasted, cool in the fridge or freezer while you make the cheesecake filling. Whip the heavy cream and 1 tablespoon of sugar until stiff peaks form. Set aside. Beat cream cheese, 2/3 cup sugar and vanilla extract until smooth and combined. Fold in the whipped cream until the mixture is light and fluffy. 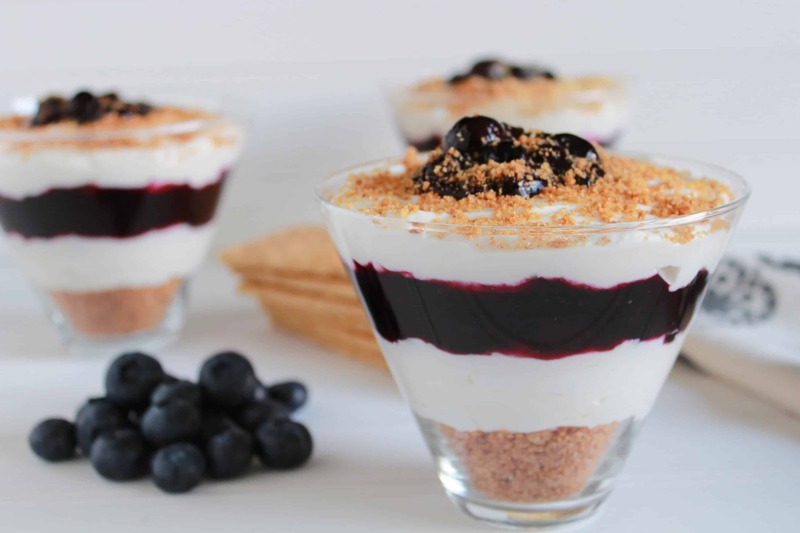 Layer graham cracker crumbs, cream cheese filling and blueberry sauce into individual serving dishes or glasses. Chill for at least one hour and serve. This recipe looks delicious and would be great for a dinner party. I really liked the individual serving glasses! I’ve made the blueberry sauce and it is delicious. Would arrowroot work for Leah as she is allergic to cornstarch? If so it can help diabetic by replacing sugar with erythritol and thickening with the arrowroot. Arrowroot should work. I am not familiar with erythritol, so I can’t speak to that. Enjoy!